Over 100 homeowners and renters from the BaMar manufactured home community met with New York Rising’s Storm Recovery Task Force at the Stony Point Center February 28. Both homeowners and renters are beginning the process of determining eligibility for a new manufactured home, a possible path to home ownership in a single-family or condo complex or to receive a rental allowance, all based on the number of family members affected if they choose to move. BaMar residents met with New York State officials on January 26 at the same location to learn of the newest plan—possibly the last–offered by FEMA (Federal Emergency Management Agency). Under the new proposal, those with a family of four or more would receive up to $125,000; three people, up to $115,000; for one or two people, up to $105,000. Patty DeLuca’s mother, Janet Vanzetta, did receive some assistance after Hurricane Irene but her home was totaled by Superstorm Sandy. Vanzetta, 79, is now living with her daughter in Tompkins Cove. People who applied under the former GOSR offer must re-apply for the new one. The Rockland Action Coalition is working with GOSR to help BaMar homeowners and renters decide the next step. RAC can be reached at 708-5799 Ext. 202. 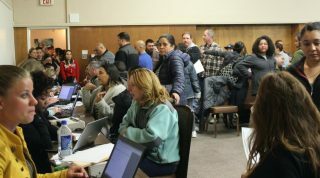 To download an application and get the process started, go to www.stormrecovery.ny.gov/MHCRapply. BaMar residents can also call 844-212-9711 for help with their applications.